One of my absolute FAVORITE places is Franklin, Tn. I have been blessed to have been called to capture great moments there several times over the past year or so - including Liz & Ethan's engagement session as well as their romantic, garden wedding at Cj's. Background story: I met Liz through friends of mine whom I had the honor of being their photographer for a little over a year ago on their big day! What is SO special: This couple I speak of, the husband, is a super talented jeweler and he actually hand crafted both Liz & Ethan's rings! Wait until you see them below! We started the day off watching the radar like crazy. There were some mean looking clouds looming and we were certain that the planned outdoor ceremony was going to have to be switched up a tad. THANKFULLY, CJ's had a plan. When you see the Bride/Groom table, that was where they were going to move the Ceremony. And it would've been GORGEOUS! That is, if it rained us out. 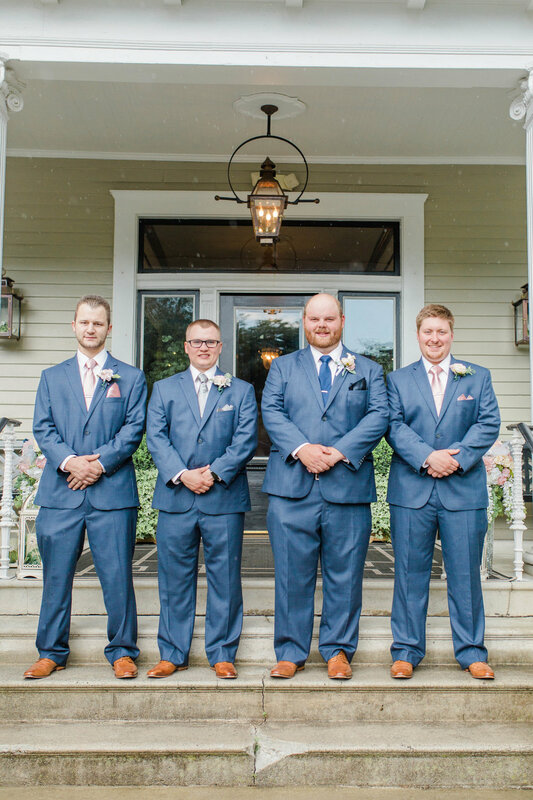 After we did the groomsmen portraits, outside, in the rain, the clouds parted and the sun came out. Giving us the most gorgeous weather for the remainder of the day! I can't begin to describe the love of the entire family: both the Bride's side and the Groom's. Liz has had to go through the most unimaginable loss of her mom and seeing her strength on her wedding day is so much more than mere words or pictures can portray. Knowing her mom was watching her was comfort in itself, but hard nonetheless. The support they both have from their families was so moving. What a wonderful thing to have so many loved ones with you on the best day ever! First looks with the bride's dad gets me every time.. and this time she did it with her dad as well as Ethan's. When Ethan's dad saw her.. he took a step back and said.. "WOW". You will see giraffe's in some of these picture and you may wonder.. why. Well, Giraffe's were Liz's mom's favorite animal! I absolutely LOVE how Liz had every detail covered and found so many ways to incorporate her mom throughout her entire day! and we can't forget about the groom! The story behind this: Liz and Ethan always gifted each other scrapbooks yearly. Since this year, they will be together and no longer will need to share them, Liz snuck and made this scrapbook as a huge surprise to her new hubby! She even had pictures in it from WEDDING DAY!! She put so much thought and love into this!